'Design - For Life!' ...'And Live - For Design!' (Magic Mottoes 2 & 3) Can Interior Design make you a better person? Alizia Tame(t) believes it can. In this book she will take you on a journey through the most private Interior of all: her thoughts and feelings. Everyone has heard of her creations - the Bridge Hallway, the Funnel Office, the Dawson House with its sofas that run on rails: now you can experience the life that lies behind them. Meet her husband Jem - the postmodern potter - who is in many ways her inspiration. Share the thrills and anxieties of juggling family and career. Discover the truth about her partnership with Fisher Paul and Simon Sanders at IntArchitec, the world's most innovative Design practice. Remember that when your world flips upside-down it is sometimes the most surprising people who turn out to be your friends ...For while Alizia has a Design for everything from relationships to work to motherhood, the people who matter most to her refuse to fit. As the gloss she has put on her life begins to crack she realises there may not, after all, be a Magic Motto for everything. And where can she find happiness then? 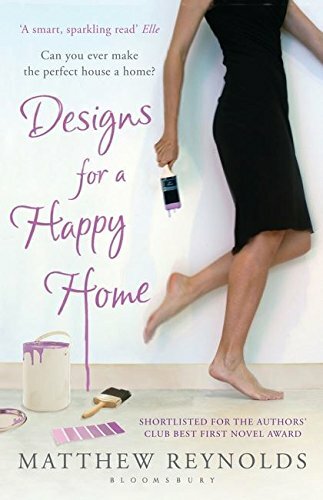 Designs for a Happy Home is the sparkling story of a sometimes impossible, often infuriating but ultimately loveable heroine whose pilgrim's progress through modern marriage is at once funny, poignant and unforgettable.